Published: Jan. 28, 2013 at 11:07 a.m. Updated: Jan. 28, 2013 at 11:42 a.m. In an effort to combine two of the greatest passions of sports fans everywhere -- the Super Bowl and fantasy football -- we've ranked the top 10 greatest Super Bowl performances of all time per position, based on fantasy points. Players were rewarded four points for touchdown passes, six points for rushing and receiving touchdowns and one point for each 25 passing yards and 10 rushing or receiving yards (including fractional points). Without further ado, let's venture down championship memory lane with a look at the 10 best quarterback performances in the biggest game on the planet. Young's 325-yard, six-touchdown performance in a 49-26 win over the San Diego Chargers was the greatest ever for a quarterback in the Super Bowl. 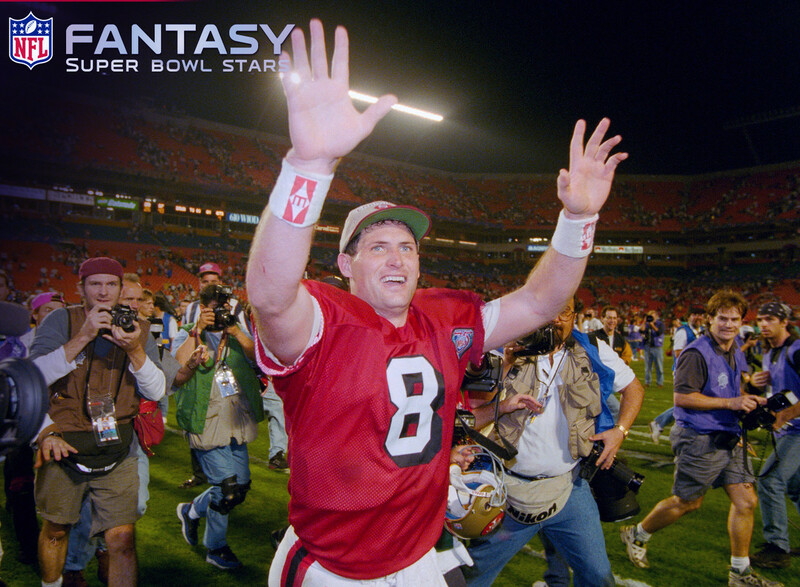 He broke the previous record of five touchdown passes (Joe Montana, Super Bowl XXIV) and led the Niners with 49 rushing yards for a total of 41.9 fantasy points in the contest. The immortal Montana had one of the best all-around performances at the position in a 38-16 win over the Miami Dolphins. He completed 68 percent of his passes, threw for 331 yards with three touchdowns and rushed for 59 yards and a fourth touchdown. All told, Montana would score 37.1 fantasy points -- 4.8 fewer than Young. Montana threw for 297 yards and what was then a record five touchdowns in a 55-10 win over the Denver Broncos. His stat line totaled an impressive 31.9 fantasy points. One of the best quarterbacks to ever grace the NFL gridiron, Montana earned a record third Super Bowl MVP award in the contest as a result of this performance. Williams tossed four touchdown passes as the Redskins scored a record 35 points in the second quarter in a 42-10 win over the Denver Broncos. Amazingly, the Skins scored five times in 5:47. Williams, who recorded 29.6 fantasy points, threw scores of 80 and 50 yards to Ricky Sanders, a 27-yarder to Gary Clark and an 8-yard pass to Clint Didier. Aikman wasn't a great fantasy quarterback, but his 273-yard, four-touchdown performance in a 52-17 win over the Buffalo Bills was the fourth-best at his position in a Super Bowl. He threw touchdowns of 19 and 18 yards to Michael Irvin, a 23-yarder to Jay Novacek and a 45-yarder to Alvin Harper to finish with 29.7 points. Bradshaw threw for 318 yards and what was a Super Bowl record four touchdowns (28.7 fantasy points) in a 35-31 win over the Cowboys. The Blonde Bomber would connect on touchdown strikes of 28 and 75 yards to John Stallworth, a 7-yarder to Rocky Bleier and an 18-yard pass to Lynn Swann to win his first Super Bowl MVP award. Anderson finished with 300 passing yards and three total touchdowns in a 26-21 loss to the 49ers. He threw for scores of four and three yards, both to Dan Ross, and rushed for a 5-yard touchdown. Anderson's numbers exceeded the totals of Montana, but his success wasn't enough to overcome San Francisco on the scoreboard. While it took a Super Bowl record 26 minutes and 55 seconds for the first points to be scored, the Patriots and Carolina Panthers still combined to compile 868 total yards. Brady had 354 yards, scored 27.4 fantasy points and tossed three touchdown passes. His scoring strikes went to Deion Branch, David Givens and Mike Vrabel. In one of the most memorable Super Bowls ever, Warner threw for 377 yards and three touchdowns in a 27-23 loss to Ben Roethlisberger, Santonio Holmes and the Steelers. His scoring strikes came on passes of 1, 1 and 64 yards, two of which went to superstar wideout Larry Fitzgerald. McNabb didn't receive a lot of recognition for his lone Super Bowl start, but his stat line was solid. Though he did throw three interceptions in the 24-21 loss to the Patriots, McNabb finished with 357 yards, three touchdowns and 26.3 fantasy points. He threw touchdown passes to Brian Westbrook, Greg Lewis and L.J. Smith.